Captain Billy Trimble sent me another recipe that I thought the Way Upstream community might like to try. 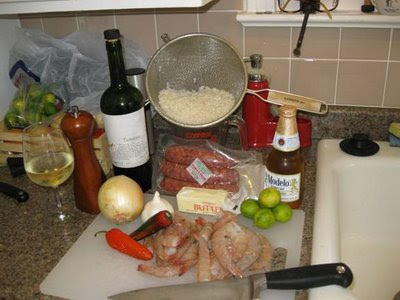 This one is for Shrimp and Sausage Jambalaya. Here's what the chef wants you to know, "Jambalaya by definition (a traditional Cajun dish) is whatever you have in the fridge combined with rice. It can be as simple or as complex as you would like it to be. 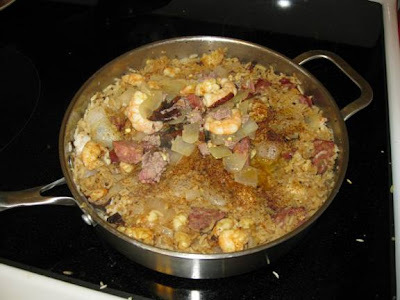 There are two different ways to make Jambalaya, one is to combine sautéed ingredients with pre-cooked rice and the other is to add uncooked rice to the sautéed ingredients and let them cook together. 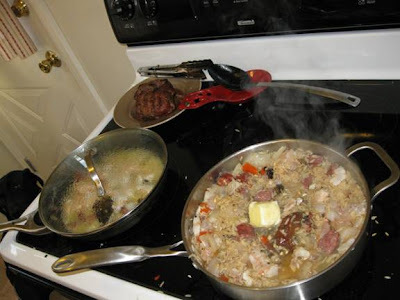 The advantage to cooking the rice and ingredients together is that you get much richer flavors in your Jambalaya. 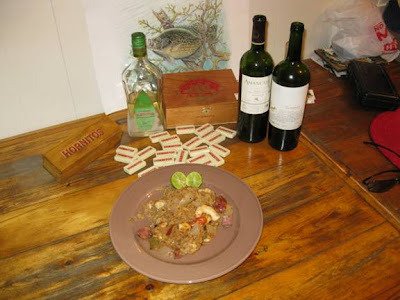 When I cook Jambalaya I add a couple of small twists to the process, I brown the rice in hot oil before I add the ingredients to sauté and I do not use water to hydrate the rice but instead use stock and beer." Brown one cup of rice in light oil then add onions, garlic, sausage, peppers, salt/black pepper and cayenne. 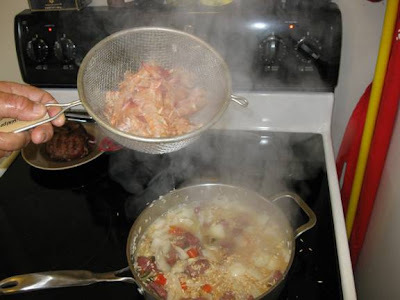 Sauté these ingredients until the onions clarify. Next add shrimp stock (one cup) and one beer. Cover to simmer for 10 minutes. Uncover and add cubed shrimp, butter and lime juice, recover and cook on low heat for another 10 minutes. Then it is ready to serve. 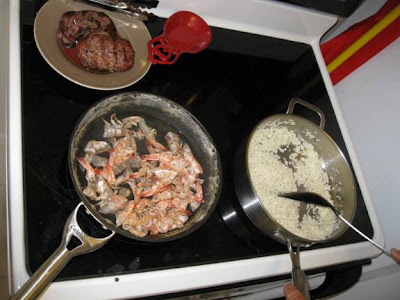 Long grain white rice (rinsed), 1 # of medium shrimp (de-veined & cubed), Venison or andouille sausage, Yellow onion, Garlic, Jalapeno peppers (de-veined), Poblano peppers, Butter, Limes, Black pepper, Cayenne pepper, Sea salt, Oregano , Beer (your choice) and Shrimp stock. photo 1 - The Ingredients ready to go. photo 2 - Boil shrimp husks for stock and brown cleaned rice in light oil. 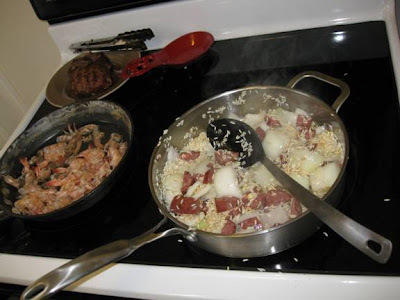 photo 3 - Add onion, garlic and sausage to browned rice. 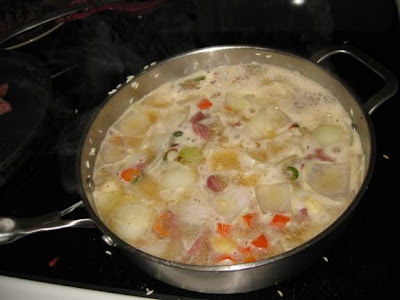 photo 4 - Strain shrimp stock into sauté. 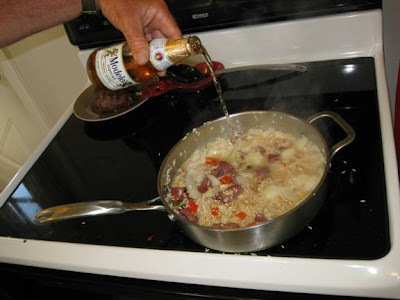 photo 5 - Add beer into sauté. photo 6 - Cover and simmer for 10 minutes. photo 7 - Uncover and add cubed shrimp, butter and juice of 3 limes, cover and cook at low heat for 10 more minutes. photo 8 - Uncover the pan to reveal the finished Jambalaya. photo 9 - Plated and ready to eat. Accompany this dish with your favorite beer, full bodied white or light to medium bodied red wine. Remember to be creative and enjoy the process. Oh Man, that looks great - and is making me hungry! Thanks Capt for the recipe and sharing it around. I am gonna have to give it a whirl. That looks mighty good. I'll have to try that. Let me know how your Jambalaya turns out Sam and Marie. Stay tuned for Capt. Billy's Ceviche' recipe in a few weeks.